PvP maps are very popular in Minecraft PE where several teams are fighting each other. 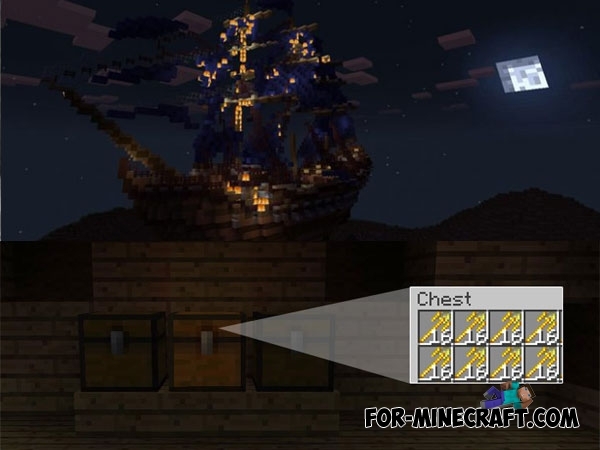 Ship Wars is no exception and consists of a map with a ship and a weapon addon. After installing the map and activating the addons, you will appear on one of the two ships of different colors where the main battles take place. Players will receive three types of new weapon chosen for powerful explosions and burned. The map is designed for six players, this is for ideal battles. 1. Your main task is to destroy the enemy's ship. At the same time, you can kill players from the opposite team. 2. Only allowed to use the weapon, which is in the chests. You will definitely like the new weapon, it is much more powerful than arrows and can set fire to the wooden parts of the ship. 3. It is forbidden to build anything on a ship. Divide into two teams (all players must activate the addon). Then enter the command shown on a sign and take the weapon from the chests. Before you start the game, count down. If you use this map on your servers or playing realms, then invite no more than 5 people for each team.